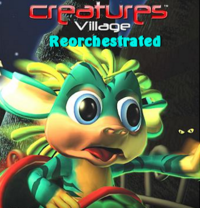 Creatures Village Reorchestrated is a series of Creatures albums by C-Rex. Each album will contain roughly ten tracks: five from Creatures Adventures and five from Creatures Playground . Each track is remade to sound superior to the original game music, which uses a limited range of unrealistic-sounding MIDI instruments. C-Rex first began work on the first installation of Creatures Village Reorchestrated in late 2012, but was halted due to his laptop breaking. Work on the project began anew in February 2013, and the album was released in May 2013. The album uses a wide variety of software instruments including piano, guitar, string section, string quartet, bass, trumpets and a brass section, in order to capture a more "natural" feel than the original tracks. This page was last modified on 20 December 2016, at 16:12.